Putting unexpected visions of space tourists aside, now for something completely different. This was a busy weekend with Calligra Suite Sprint 2013 which despite of different timezone fully dominated Essen and Bangalore. More about that here, here, here, here, here and here. You can find the full agenda on the KDE Community Wiki. Lords of the ring like me were able to join at least remotely through various media. So here's a list of my limited activities. The Modern GUI and Startup screen is already established in Kexi, people know it and use saving many mouse clicks. 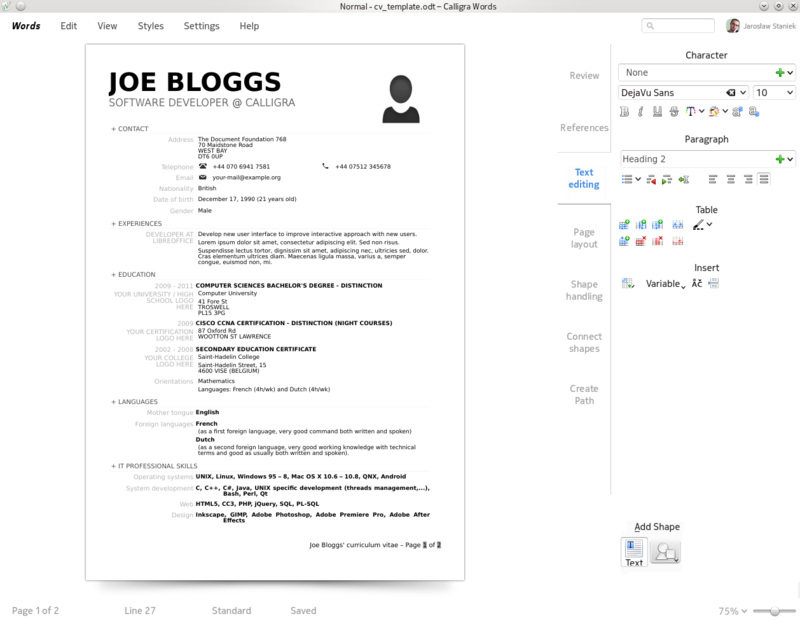 I took some time to present a follow up, mockup of how Calligra Words word processor would look. The topic was iterated before at the previous sprint. You can read about the story behind the look and inspirations that can influence what I'll try to do. Obviously thanks to the Qt Quick taking over the overall GUI concepts, our users can expect the apps can be run will pleasure. Yes, it's time for the desktop. The Kexi virtual BoF turned out to be an IRC meeting between me and Smit Patel, a Calligra dev who is successfully collaborating with me already on the Bibliographic Database project for Calligra Words. It takes advantage of rather awesome desktop database capabilities that Kexi offers to other apps. This time we covered fully fledged Mail merge for Calligra, an initiative that was planned long ago. It should be as easy as possible (no tinkering with database/data source as in LibreOffice) and visible in Words with some optional visibility in Kexi for premium integration. Like the Bibliographic Database, Mail Merge reuses certain features of Kexi so that provokes my attention. More on the Mail Merge Design wiki page. Finally a small announcement about interesting opportunity: Karbon, Plan and Braindump apps from Calligra are looking for new Maintainers. That's rare opportunity for you! 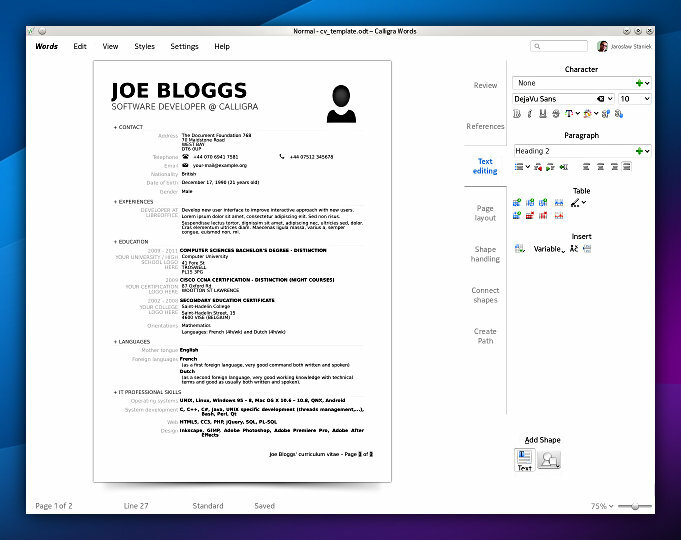 I like it that Calligra is doing looking at the whole office suite idea from a fresh perspective and not just copying everything from the bigger players. This prettyness and out of your face approach, I think could be it’s great selling point apart from the technical superiority of Forms/Flakes. Thanks, I am glad you like the approach. By the way, someone asked me what's the CV template used on the mockup. It's from our friend project LibreOffice. Yeah, I like the experiment. So changing the Base to non-white you'll get non-white background. I do not say there would be no other options (that's KDE after all) but obviously defaults sane for Joe user who won't play with settings. sorry to say that, but calligraauthor is unsuitable for creating even simple ebook. Idea to improve that is good but I find those huge tabs a mess. And how do they work when user detach the sidepanel or place it to left side? Do they swap side or what happens? We can not assume that user has sidepanel on right side docked. I like the current idea where user has big group tabs, the elements in sidepanel just needs to be done correctly with style, now all buttons and droplists looks like a mess. And I don't like at all the Kexi style... yes it can save mouse travel time, but that isn't the issue, the issue is that current solution and multiple window (open/save dialogs etc) offer far better usability than forcing everything to one window what is by logic designed for tablets and smartphones instead workstations where the work is done with keyboard and mouse. 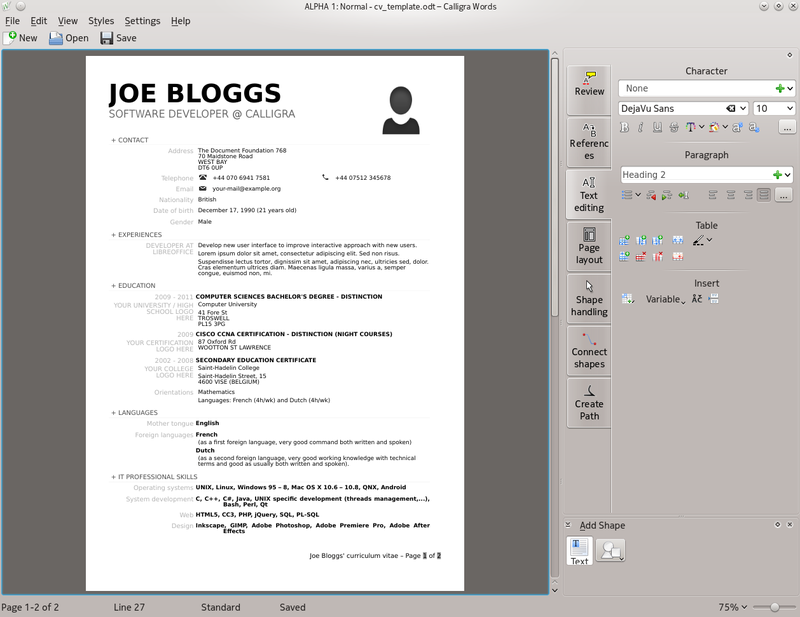 Already it is huge mess that Koffice (&calligra) starts with full size window where it is asked to open or create new document, while the window could be much smaller and more sane sized. The greatness in KDE has always been that it does not try to force single GUI everywhere and to every user. Kexi has long time abandoned that and it does not fit at all to KDE and now seems like it is wanted that whole calligra goes same direction, abandoning all the great usability features and possibilities just to design everything for touch screens and small screen devices. Interesting opinion. Still in my book this is not the best metric in terms of usability analysis. For example users have no problems with browsers and the Plasma Desktop, both of them occupy most of the display. I've not observed user that likes to see a modal dialog popping up on another display (not the one where her focus stays). No, quite conversely, she prefers to have a context. I wrote many times why the small dialogs and modal dialogs are easy implement and hard to interact with when much of the information gets covered. None of the mockups are created because of the tablet/phone convergence. Calligra is developing separate UIs for smaller form factors. I have to assure that Kexi and other apps will have fair share of docking/undocking options to properly support multi-display configurations. We're absolutely not developing a SDI UI. Just not everything have to be configurable (not every tiny bit undockable). Qt Creator finds a balance here, though its multi-display support needs further extensions. 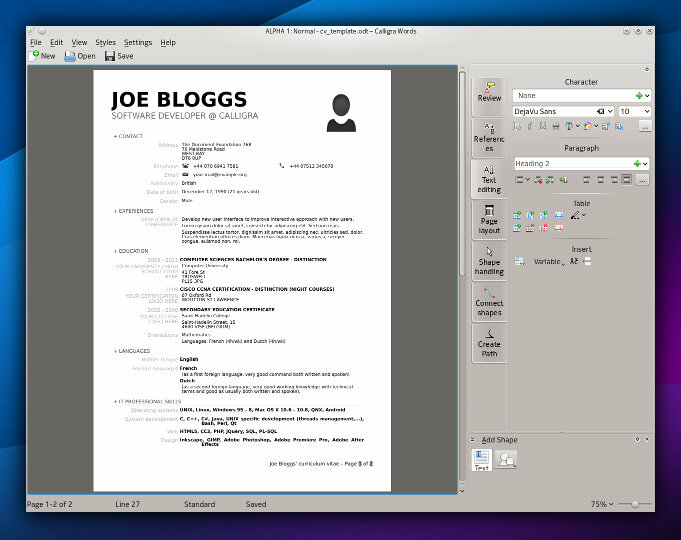 "The greatness in KDE has always been that it does not try to force single GUI everywhere and to every user. " Every 'great' feature should have priority assigned first. You'd be surprised that the proposal on this and previous mockups actually give more flexibilty and power to application developers than just skins based on Qt widget styles (QStyle), Window Manager decorations and Plasma themes. When you change any of these settings, the GUI is more or less the same in terms of geometry, layouts. Even margins and padding is more or less similar. Moreover QStyle for widgets (e.g. the borders,shadows, including Oxygen) are designed for a single common DPI (don't ask me to say it's not "Retina-ready" or accessibility-ready :) The current way of styling has not changed (conceptually) since Qt added styling to the Win95 type of GUIs, earlier to Motif. This is easy for developers but the side effect is that we do still not have high-quality HIGs maybe because people think common API-based implementations replace HIGs.